SNAFU! 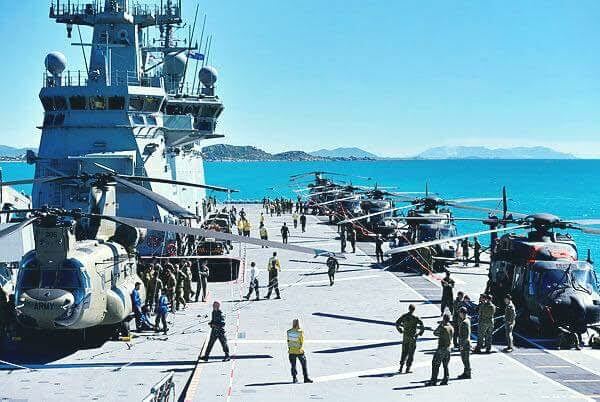 : HMAS Adelaide has been busy...AND has a full deck of Aussie aircraft! HMAS Adelaide has been busy...AND has a full deck of Aussie aircraft! Thanks to Jamie for the pic! Ok this is more like it! I forget sometimes that Australia is a SMALL country...I'm not even sure if its bigger than Texas or California population wise so considering all that its a pretty impressive force they're assembling. Still wish it was aimed more at amphibious ops but this pics proves they're working in that direction. The only thing that could make this better? If I saw a Tigre or two... but this is a busy flight deck and a busy flight deck is a good flight deck.